Joan Snyder, Dear Irene, 1970, oil, acrylic, pencil, and spray paint on canvas, 15 x 15". The snappy title of this summer group exhibition—“Elaine, Let’s Get the Hell Out of Here”—comes from an anecdote relayed by Elaine de Kooning in response to Linda Nochlin’s feminist essay “Why Have There Been No Great Women Artists?” (both Nochlin’s essay and de Kooning’s tale were published in the January 1971 issue of Artnews). The painter recalled an incident when a boorish man at a party began to ask her and Joan Mitchell, “What do you women artists think . . . ?” Not waiting around for him to finish his query, Mitchell—as famous for her uncompromising attitude as for her take on Abstract Expressionism—grabbed de Kooning’s arm and split. With works spanning fifty years, this show poses a provocative question: How can artwork serve the politics of liberation (of race, gender, or sexuality) without explicit representation? In the older works, identity politics often remained subtle. 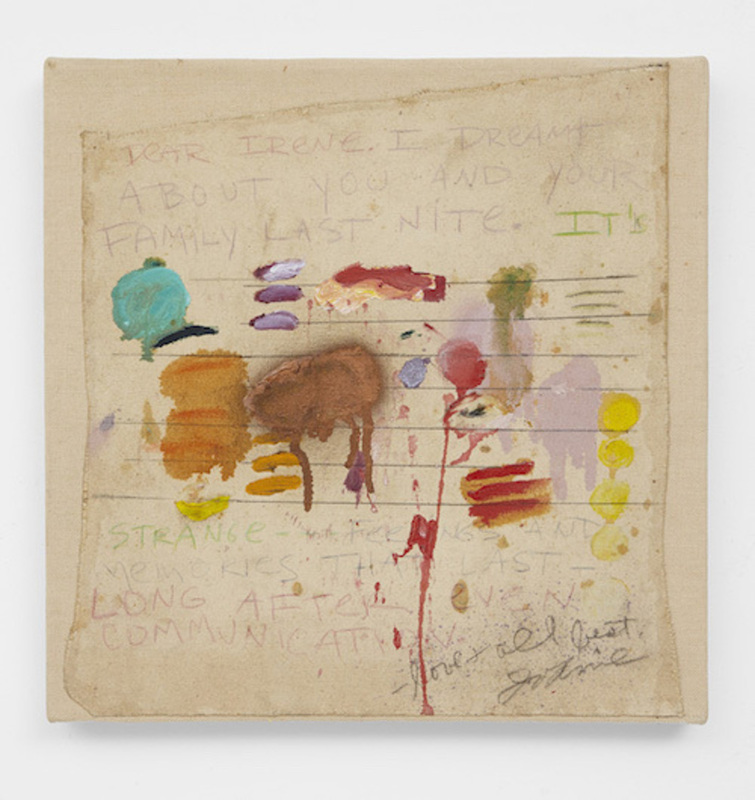 Consider de Kooning’s portrait of the queer dance critic Edwin Denby, 1960, or Joan Snyder’s Dear Irene, 1970—a sly love note scrawled in graphite and colored pencil, surrounding expressionist daubs of rainbow-colored paint. Rosemary Mayer’s resplendent sculpture Balancing, 1972, with swags of peach and pink fabric hung from acrylic tubes and cords, evokes flesh. Yet despite her feminist inclinations—she was a cofounder of the all-women A.I.R. Gallery—she insisted her work wasn’t solely focused on depicting the female body.